So much for following a schedule. We've developed something of a reputation for causing weather mishaps by going to the movies. There was the tornado the night we went to see Captain America: The Winter Soldier...the freak lighting storm when we saw Guardians of the Galaxy...the downpour when we saw Jurassic World...just to name a few. Well, the curse has been broken! Yesterday it was bright and sunny when we entered the theater and when we left! Yay! I was not at all surprised by the number of adults without children in the theater. Sometimes I think the Minions have more adults than children among their fans. For the unenlightened, Minions are cute, funny, easily distracted, and have a special fondness for potty humor and photocopying their butts. They laugh a lot. And they're absolutely loyal. Picture a bunch of hyperactive toddlers. Yep, that's the Minions! This movie explains the origins of the Minions (voiced by Pierre Coffin) from single-cell organisms at the beginning of time, emerging to serve their first master--a T-Rex. Minions were created to serve--but, as narrator Geoffrey Rush explains, finding a master is easy. Keeping one is another story. 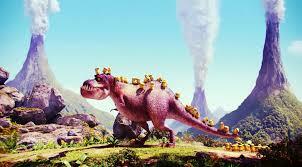 They almost immediately cause the demise of the T-Rex...and it's all downhill from there. From dropping a pyramid on the Pharaoh to waking Dracula for an early morning birthday surprise involving sunlight to inadvertently aiming a cannon at Napoleon, the well-meaning Minions prove a hazard to villains throughout time. Finally, they go into hiding in an ice cave in Antarctica. Over time, however, they become deeply depressed by their lack of purpose. Kevin, the leader of the tribe and the smartest of the Minions (which isn't saying much, really), realizes they may not survive. 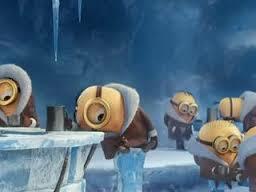 He decides to leave the ice caves and go out into the world to find the Minions a new master. Accompanied by then-teenager Stuart and youngster Bob, he sets off on a journey that lands the trio in New York City in the '60s. While trapped in a mall overnight, they see a TV ad for Villain-Con (Comic-Con, anyone?) and decide to go there to find a new master. They hitch a ride to Orlando with a family of bank robbers (Michael Keaton and Allison Janney voice the parents). 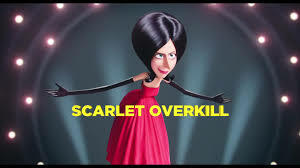 There, while attempting to rescue his teddy bear in a mob of eager villains, Bob ends up winning a competition to serve the world's first female supervillain, Scarlet Overkill (Sandra Bullock). She and her inventor husband, Herb (Jon Hamm), take the Minions home to their castle. Scarlet orders the Minions to steal the crown of the Queen of England. She wants to be Queen, and plans to take over the country. Herb equips them with some of his inventions, and they nearly succeed...until an attempt by little Bob to save himself and his buddies from the palace guards fulfills an ancient legend and Bob is declared King (think Excalibur). Scarlet is furious and accuses the Minions of betrayal. They immediately give her the crown and declare her Queen, but she responds by imprisoning them. 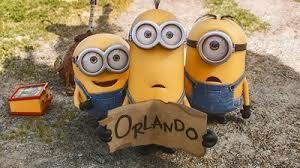 They escape, and while their fellow Minions travel the world to find them, the trio look for a way to stop Scarlet. Do they succeed? Will they ever be reunited with the rest of the tribe? And how do they meet Gru, who will be their master for many, many years to come? Minions answers all of these questions. Whether you have kids or not, I happily recommend this one. Laughter is healthy, and Minions is just what the doctor ordered! Sounds adorable. Glad you lifted the weather curse. Minions must have plotted in your behalf. A terrific review, and nice to lift that curse! Why am I not surprised by the notion that Napoleon would have had Minions? Wonderful review. I have see the clip on TV and giggled. Daughter noticed that in the clip they sexualized (sp) the minions. 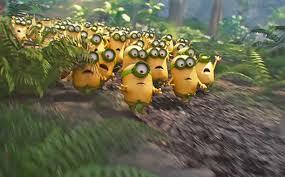 I didn't see that and I hope not because I like the crazy minions just the way they are. 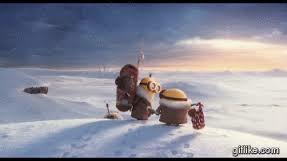 Eve: I'm pretty sure if the Minions had been involved, we would have ended up with a blizzard in July! 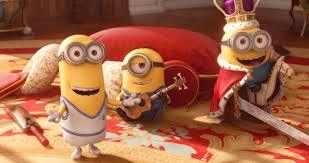 William: Yep, he had Minions. After they fired the cannon at him, his men chased them until they finally got away. That's when they went into a self-imposed exile. They didn't get that they were no good at being henchmen because they really aren't evil. 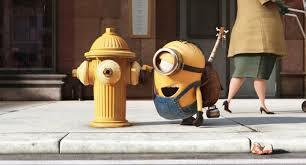 Gayle: I don't recall that--unless she was referring to Stuart hitting on the fire hydrant. As far as I know, they're all male. I don't know ? something about a hot tub ? 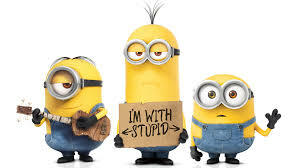 But I am happy they are just minions. Off to get a happy meal bad language and all. I want one now. Yes--that was Stuart in the hot tub with two yellow fire hydrants. I love Stuart--his eyesight is as bad as mine! If only we had a theater close to here. Sigh. Mari: Eventually, everything will come to us via streaming. It can't happen soon enough for me. I'd much rather watch a movie in the comfort of my own home. Grace: We were really starting to wonder! 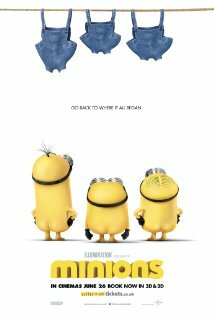 At the start of the movie, Geoffrey Rush is explaining how the Minions came into existence as single-celled yellow critters who emerge from the water looking much as they do now, except for wearing fig leaves instead of overalls. The last one out realized he was naked and went running back into the water. Rush: "That's Norbert. He's an idiot." Great review, Norma! My kids want to see it, now I do too! Sound hilarious:). I am totally out of touch regarding these little ones-can anyone answer a question? Why do some have 2 eyes and others just 1? Anyone have a kid I can borrow to go see ? PS--As for why some have one eye and others two--not to mention why some are bigger than others, that has yet to be explained. Thank You, Norma ! OK, we don't need a kid, Thank goodness, at 72 the Mr. and I are just starting retirement ! Minion Bob--hummm... maybe a new name for The Mr.
What a great review about what seems to be a really fun movie! I'm hooked! Glad the weather cooperated this time! I did see the movie--a case of must since a young relative was involved--and it was cute. Not something I'd choose to see if left to myself...but then I seldom go to the movies! Sierra Sue: That would be a good nickname! Cheryl: We were relieved--but if we have storms when we go to see Ant-Man, I can only conclude the curse is only concerning Marvel movies. Hey Norma: I must skip reading this post because I never read reviews prior to seeing a movie. Yesterday at Barnes, they had a full-on yellow display of these little guys.